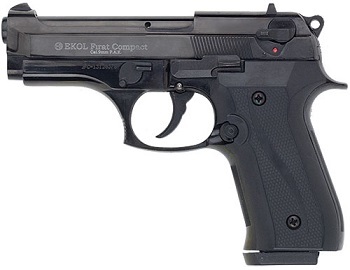 Image Below Or Add To Cart Beretta V92-F Compact 9MM PA Blank Firing Gun Replica-Firat Compact: This is a replica of the famous Beretta Compact 92F. Weighs, feels and fires like the smaller original. Fires 15 extra loud 9mm PA blanks as fast as you can pull the trigger. Great as a stage prop, Military training, Police training, Gun Safety Training, collecting and as a Display Gun. Caliber: 9MM PA Blanks, Length 7 ½ inches, Weights 2 ½ Pounds, Rounds 15 Plus 1. Comes complete with one magazine and a hard-shell carrying case: Beretta V92F Compact 9MMPA Blank Firing Guns.There is an optional 25 Round Magazine available for this Model.